The elliptic integrals may be computed analytically [Abramowitz and Stegun, 1964] or numerically using subroutines CEL1 and CEL2 in the IBM Scientific Subroutine Package . This section describes the mathematical relationships between star sensor measurements and catalog star positions (Section 5.6) for the slit- and image dissector-type sensors described in Section 6.4. Sensor response to star magnitudes is also discussed. Because of the close interaction between the interpretation of star sensor measurements, spacecraft dynamics models, and attitude determination techniques, we will refer to material in Sections 16.2 and 17.1. Star scanners, or slit star sensors, use a photomultiplier and electronic assembly to detect stars crossing a slit configuration. The exact form of the scanner measurements will depend on the particular type of instrument being used (Section 6.4). In general, however, scanner output will consist of a series of times corresponding to star crossings with detected intensity greater than a specified threshold, or a series of detected intensities from which crossing times may be deduced. The mathematical model for star scanner measurements presented in this section follows the analysis of Grosch, et al.,  and Paulson, et al., . Consider a transparent slit etched on an otherwise opaque plate in the focal plane of a star scanner optical system. If a slit is a straight line segment and the optical system is free of distortion, then a plane, known as the slit plane, is defined which contains the slit and the optical center of the lens. A distant bright point source, e.g., a star, will be sensed by a detector behind the slit, if and only if it lies in the slit plane. The instant the star crosses this plane is called the transit time. The spacecraft three-axis attitude at any one instant is defined by three independent angles. Equation (7-107), however, provides only one condition at each star transit time. To provide the additional information, the equations of motion of the spacecraft may be used to obtain a time-dependent characterization of the attitude, which involves just a few parameters. Alternatively, an attitude time history may be provided by a system of gyros. This attitude model or history, described further in Section 17.1, may then be used to internally couple the conditions in Eq. (7-107). In addition, if more than one slit is employed, each star will yield two spatially independent measurements. The additional information per star which is gained from a multislit system may be exploited to reduce the number of required stellar targets or to increase the data sampling rate. This set of equations may be used with the attitude model to identify observed stars, as described in Section 7.7. After star identification, these equations may be used to refine attitude model parameters as described in Chapter 3. In some cases, the relationship between slit geometry and the attitude model allows considerable simplification of Eq. (7-109). For example, consider the "N" slit sensor, as shown in Fig. 7-24, mounted on a uniformly spinning satellite in a torque-free environment (Section 16.2). As the satellite spins, transit pulses will be generated at times /„ t2, and t3 by a star passing the three slits. This equation may be used for observation identification and attitude model refinement instead of Eq. (7-109). 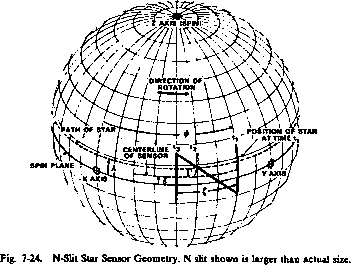 Image dissector tube star sensors, such as the Ball Brothers CT-401 Fixed Head Star Tracker used on the SAS-3 and HEAO-1 missions (Section 6.4), measure two coordinates U and V, as shown in Fig. 7-25, which are ideally proportional to the position of the observed star's image on the sensor's focal plane. is tan <p= U/f tanX = (jy/)cos<(> where / is the focal length of the lens. Because image dissector tube sensors are subject to optical and electronic distortion, temperature, magnetic, and star intensity effects, the simple relationships in Eq. (7-114) are not precise. Gates and McAloon , Geavinger and Mayer  and Gray, et a!.,  describe the calculation of <j> and X from U and V using an empirical model based on laboratory calibrations. The following series for the computation of </> and X takes into account optical and electronic distortion and temperature effects. where u= U/f, v= V/f, and the coefficients C and D are temperature dependent. The magnitudes of magnetic and star intensity effects vary depending on the particular sensor being used. For the Ball Brothers star trackers used on HEAO-1, magnetic effects are approximately 0 to 20 arc-sec, depending on the magnetic field strength and the star position in the field of view. Intensity effects are approximately 0 to 45 arc-sec, depending on the star magnitude and the position in the field of view. Algorithms for the calculation of corrections to <j> and A due to these effects are discussed by Gray et al., [1976J. where A is the spacecraft attitude matrix and M is the transformation matrix from the spacecraft body frame to the star sensor reference frame. In general, a star sensor's spectral response is such that neither the visual, V, nor the blue, B, star magnitudes defined in Section 5.6 accurately corresponds to the magnitude measured by the sensor. Instrumental star magnitudes, that is, magnitudes which take into account the spectral response characteristics of the sensor, must be calculated for each sensor to create a star catalog which contains a minimum of stars but includes all of those that the sensor is likely to observe. Instrumental magnitudes are also necessary for modeling the output of sensors which provide intensity measurements. where h is a constant between 0 and 1. This constant may be determined by comparing the laboratory-measured wavelength response of the sensor and the wavelength sensitivities of the B and V magnitudes given in Section 5.6. An experimental value for h may be obtained by varying h until the observed distribution of instrumental magnitudes best matches a theoretical distribution of stellar magnitudes or until a sharp sensor magnitude limit is obtained. = C, + D,m, where C, and D, are sensor-dependent coefficients obtained from laboratory calibration. See Section 5.6 for a further discussion of stellar magnitudes. Star identification refers to the process used to associate sensor observations with stars in a star catalog. 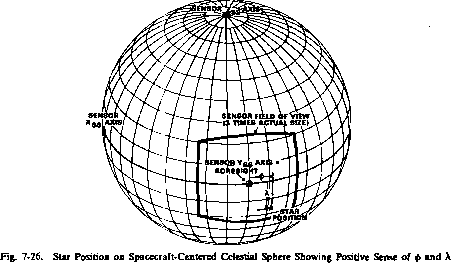 Because the sensor observations can be related to a spacecraft reference frame, and the star catalog gives star positions in an inertial frame of celestial coordinates (CC), this identification allows computation of the spacecraft attitude. The process of star identification usually begins with the transformation of the sensor observations to a frame that is as close as possible to celestial coordinates, called the estimated CC frame. This permits the identification algorithm to operate with the smallest possible error window, thereby reducing misidentifications and ambiguities. If the initial attitude estimate is poor or if an inaccurate model of spacecraft motion is used, the estimated CC frame may be very far from the true CC frame; this would normally be the case, for example, during attitude acquisition. When the model of the spacecraft motion is poor, the estimated frame may also be seriously distorted; in other words, the angular distance between observations in the estimated frame may differ significantly from the angular distance between the corresponding catalog stars in an undistorted frame. This greatly complicates the star identification process, and may even make it impossible. In this section we discuss four types of star identification algorithms: direct match, angular separation match, phase match, and discrete attitude variation. 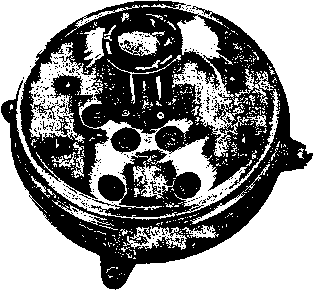 The direct match technique matches each observation with a catalog star lying within a specified tolerance of its position. This requires that the estimated coordinate frame be very close to the true coordinate frame. Onboard processors use this technique whenever a good guess of the attitude is available (e.g., HEAO-1; see Gray, et a!., , The angular separation technique matches angular distances between observations with angular distances between catalog stars and is used when the observations are in a frame that is only slightly distorted but the initial attitude estimate is not sufficiently accurate to permit the use of the direct match technique. SAS-3, where the motion model is sometimes inaccurate and the initial attitude poorly known, uses this technique [Berg, et al., 1974]. The phase npatch technique is a one-dimensional version of the angular separation match. Known star azimuths* are compared with observed star longitudes as the phase between the estimated and true frames is stepped through 360 deg. This may be used when the observations are in a frame that is only slightly distorted and when the spin axis of the spacecraft is well known but the phase angle about the spin axis is poorly known. HEAO-1 used a phase match for its original attitude acquisition [Gray, et al., 1976]. Finally, the discrete attitude variation technique, appropriate when everything else fails, uses the direct match or angular separation technique, as the initial attitude and motion parameters are stepped through various values in their possible range. * Azimuth will be used to mean the longitude of the observation in the estimated CC frame. In discussing the above methods, we will use the following definitions and assumptions. Distortion. If the estimated CC frame is severely distorted, star identification will be difficult or impossible because the distortion causes the need for large error windows, which causes an excessive number of field stars (random catalog stars located close to the observed star) to invade the windows. Sometimes the interval of analysis can be shortened to alleviate this problem. Scores. The result of any attempted identification procedure can be reduced to a numerical score, such as the total number of unambiguous matches attained by the direct match technique. The identification is accepted if the score is sufficiently high. Alternatively, a number of attempts, exhausting a complete set of possible values of some parameters), can be made, and the one yielding the highest score accepted. Coordinate Frame. We assume here that the observations are transformed to an estimated CC frame, but the star catalog could be transformed into an estimated sensor frame instead. Normally, the technique that requires fewer transformations would be the most advantageous. Multidimensional Matches. If a sensor also observes something other than star position (brightness, for example), a multidimensional match on position and the other observed variable can be performed. This increases the power of any technique. Related Problems. The problem of star identification is quite distinct from the apparently related problems of pattern matching such as those encountered by Earth resources satellites or by character scanning. For these, the search is for some specific set of patterns. In contrast, star identification presents an ever-changing set of search patterns, distinct for each point on the sky. where d(0', S) is the angular distance between O', the observation unit vector in the estimated CC frame, and S, the catalog star unit vector in the true CC frame; and c is the error window radius. After checking an observation against all possible catalog stars, one of three outcomes is possible: no identification (no catalog star within the error window), an ambiguous identification (two or more catalog stars within the error window), or a unique identification of the observation with exactly one catalog star. In the last case, the identification is hopefully a correct identification; if, however, the observation is not in the star catalog or lies outside the error window, it is a misidentifica-tion. Misidentifications, even in small numbers, can cause some attitude solution techniques to diverge. Therefore, care must be exercised to keep the proportion of w misidentifications small enough for the attitude solution technique employed. The score for a direct match technique can be either the number of stars identified or the percentage identified. In either case, a match is successful if the score is sufficiently high. The four probabilities given above can be used to optimize the choice of the window size, c. To do so, note that both nonidentifications and ambiguous identifications are normally dropped from consideration by identification algorithms. Misidentifications, even in small numbers, may cause erroneous results and should be minimized. However, too small a choice for c may result in an insufficient number of correct identifications. The optimum value of the window size is the one that produces the desired tradeoff between the number of correct identifications and the number of misidentifications. To illustrate this point, consider the following example, which is similar to the performance of HEAO-1. We assume that the limiting magnitude of the sensor is 7.5 visual ( V). At this limit, the star catalog is estimated to be 98% complete. Hence, q=0.98. Near the galactic plane, the star density to 7.5 V is approximately 1 star/deg2 (from Table 5-14). Hence, p=3.3xl03 stars/sr. We model A as a hyperbolic function of the expected error, a, such that at a=0, A= 1; at a = oo, h= 0; and at a = (a) (the mean expected error), A =0.5. Thus, A = e/(e + <a>) for a window of radius e. Assigning a value of 0.05 deg to <a>, we use Eqs. (7-119) to (7-122) to compute the probability of each direct match outcome as a function of e. Table 7-3 presents the results. Note that as « is increased, the probability of a correct identification rises steadily until ««2(a). The increase then slows, reaching a maximum at t«4<o), after which the probability of a correct identification declines due to an increase in the probability of an ambiguous identification. The probability of a misidentifica-tion also rises with increasing e. Therefore, the optimum choice of e would be The more important it is to avoid misidentifications, or the smaller the fraction of observations that must be identified for the proper functioning of the rest of the algorithm, the smaller e should be.